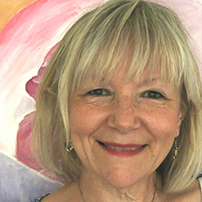 Sandy Humby is a Modern Day Mystic and Energy Alchemist with a lifetime’s immersion in the healing and empowerment path of the Sacred Feminine. She is a thought leader in the field of vibrational medicine and the author and creator of Rose Alchemy: Rose Oracle for the Heart and the Rose Alchemy Holistic Healing programme. Her journey has taken her from 18 years as a Couture Wedding Dress Designer researching the stories of Life and Love, through a deep personal inner journey of exploring the path of conscious evolution and the re emerging voice of the Feminine so needed at this time. She shares her inspirational work through seminars, retreats and a teaching program in the UK and the USA.